There are several telling signs of fakery in the document. To cite just one, typed text throughout the document does not maintain horizontal consistency. See Barack/II/Hussein/Obama and Honolulu/1. Text produced on a typewriter would typically not feature such drops, as the typewriter would move in a straight line across the document. This redacted image was online at least as early as July 2009, when it appeared in the Western Journalism Center's "Clearing the Smoke" "report." I don't know if it was created for that purpose, but it's definitely the underlying document used to make the "Blaine" certificate. There are several telling indicators of this. For instance, the "Blaine" document is missing portions of lines around certain boxes, that sync with the lines erased by the redactions in the WJC image. There's the same distinguishing hash mark in Box 7g. And most of all, in Box 21 the words "Signature of Local Registrar," which were partially erased by the white redaction box in the WJC image, are not only identically cut off in the Blaine certificate, but if you look closely, you can see how the words are identically obscured by the top edge of the handwritten signature that has been removed. The distinguishing hash mark in Box 7g? It's there. And so is the overly large signature in Box 21. Additional marks in Boxes 2, 3, 11, 12a, and others further establish that this is the document whose information was redacted to create the WJC image. So in case the obvious fakery of the Blaine document wasn't enough, now you can also see precisely what legitimate document it was forged from. Additionally, you can see why it's in low-res black-and-white, because recreating and faking the color crosshatch patterns would have been considerably more difficult. 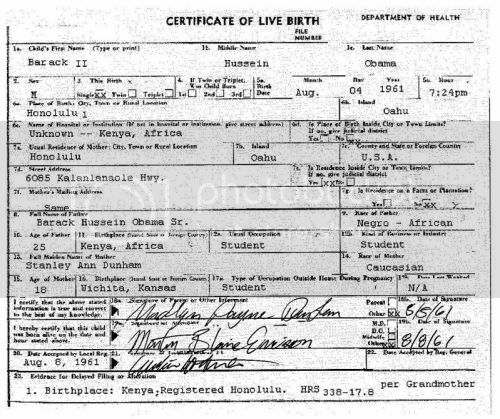 So is the "Blaine document" the creation of an overzealous Birther, or a hoax a la the Bomford certificate? The latter, as it turns out. I tracked down the individual behind it, the eponymous Mr. "Blaine," who informed me that the document was thrown together one evening to punk Birthers. And although it never gained the widespread attention of the Bomford or Lucas Smith certificates, and although many Birthers dismissed it as fake from the start, it still continues to display occasional signs of life around the web. As we've seen with so many other rumors, it's hard for any bit of wrong information to ever truly die and disappear for good. "WND never reported that Obama had spent $2 million hiding his birth certificate." "Obama has spent at least $2 million fighting efforts to release his birth certificate." Has WND reported that Obama spent millions to hide his birth certificate? Joseph Farah wrote the above in his column today at WorldNetDaily, as part of a follow-up rebuttal to a Salon article about Donald Trump repeating a Birther allegation. Is Farah correct? Has WND only reported the amount that Obama paid his legal counsel, without suggesting that all of those funds were spent on eligibility issues? Has WND never reported that Obama spent millions to hide his birth certificate? Consider the following 48 quotes from WND articles. This is not a comprehensive list; I simply gave up when I reached the four dozen mark. Also included for timeline purposes are the three Chelsea Schilling articles mentioned by Farah and Salon. "Complicating the situation is Obama's decision to spend sums estimated in the hundreds of thousands of dollars to avoid releasing a state birth certificate that would put to rest all of the questions." "Complicating the situation is Obama's decision to spend sums estimated in the hundreds of thousands of dollars to avoid releasing a state birth certificate and other documentation." "Complicating the situation is Obama's decision to spend an estimated sum approaching $1.4 million to avoid releasing a state birth certificate that would put to rest all of the questions." "Complicating the situation is Obama's decision to spend sums estimated in the hundreds of thousands of dollars to avoid releasing a state birth certificate that would put to rest the questions." "Complicating the situation is Obama's decision to spend sums estimated at more than $1 million to avoid releasing a state birth certificate that would put to rest some questions." "Complicating the situation is Obama's decision to spend sums estimated at more than $1 million to avoid releasing a state birth certificate that would put to rest the questions." "Adding fuel to the fire is Obama's persistent refusal to release documents that could provide answers and the appointment – at a cost confirmed to be at least $1.7 million – of myriad lawyers to defend against all requests for his documentation." "The ruling came this morning from Judge David Carter who as WND reported last night apparently recently hired a law clerk out of the law firm that has been paid nearly $1.7 million to defend Obama from eligibility challenges." "Complicating the situation is Obama's decision to spend sums exceeding $1.7 million to avoid releasing an original long-form state birth certificate that would put to rest the questions." "Complicating the situation is Obama's decision to spend sums estimated in excess of $1.7 million to avoid releasing a state birth certificate that would put to rest all of the questions." "Adding fuel to the fire is Obama's persistent refusal to release documents that could provide answers and the appointment – at a cost confirmed to be at least $1.7 million – of myriad lawyers to defend against all requests for his documentation, such as his original birth certificate." "Adding fuel to the fire is Obama's persistent refusal to release documents that could provide answers and the appointment – and payments to one of his eligibility lawyers at a cost confirmed to be at least $1.7 million – of numerous lawyers to defend against all requests for his documentation. That's in addition to the work done by U.S. attorneys defending Obama's eligibility, as in this case." "If one court had guts enough to deal with this and allow discovery, Obama would be out of office," Berg told WND. "We would ask for a lift of Obama's ban on all of his documents. The last official report said Obama has spent $1.6 million in legal fees [keeping his papers secret], and the total is probably over $2 million now." Larry Martin is a Birther and blogger who lives in Malaysia, and does his blogging at An American Expat in Southeast Asia. Martin gained brief notoriety in mid-2008 when his blog was cited as a source in Jerome Corsi's The Obama Nation, and when he was subsequently profiled and interviewed by Time Magazine in an article entitled The Blogger Behind the Obama Hit Job. The focus in both publications were several posts Martin made in January 2007 under the title "Tracking Down Obama in Indonesia." Most of these entries were explicitly identified as being foreign news articles that Martin had translated from Indonesian into English. On January 24, 2007, Martin posted part 3 of that series, where he described information that appeared on school documents of Obama's from the Fransiskus Assisi school in Jakarta. He did not provide images of any documents, however. The Associated Press reported on the document and its contents at the same time. At the time, Martin didn't frame his posts as being anything other than the fruit of online research. He wrote at FreeRepublic on January 17, 2007 that "contacts of mine informed me that there are some 'american' people in Indonesia looking for photos and other evidence." Not himself; just others. According to second-hand information. "Im been investigating this since 2006 at my own expense - I never questioned the school documents when I first saw them with my own eyes - even though he was listed as an Indonesian citizen - maybe I overlooked it - I asked for a certified copy and at the time was politely refused." Martin says he got the information independently, having traveled to Obama's former school himself in January 2007 to view the documents. "They had it in a book and I just looked in a book," he says. "I just happened to say, 'Hey, I'm a blogger, can I see [the documents]?' and they said, 'Yeah no problem.' " Martin says the AP photo "vindicates" his research. What I can say now is that I have seen the BC with my own eyes and it does exist - however it was a BC for Barry Soetoro and not for Barack Obama - at the time I did not think to look at the copy or to write down what was on it - the concern was whether or not Obama was a Muslim - the school registration was all I saw that mentioned Islam and as such - it was reported by me on 24 Jan 2007. Barack Hussein Obama was known as Barry Soetoro when he was in Indonesia and was registered for school by Lolo Soetoro Mangunharjo as first reported here on this blog on 24 January 2007. It would be August of 2008 before the Associated Press would release the photo of Barry Soetoro's school registration and as such vindicating what I originally wrote. As part of my book research, I contacted Mr. Martin to inquire about this escalating account. How in January 2007 he'd focused only on translating online articles; how a year and a half later that changed to him claiming that he'd conducted a personal investigation to Jakarta and had seen the school document in person; and how after another two and a half years he suddenly claimed that he'd also seen a previously-unmentioned birth certificate during that trip. In addition to this four-year-long evolving saga, Martin has also never produced any evidence of making this purported trip. Time Magazine apparently took his claim of an in-person visit to the school at face value; but all Martin has ever provided is his own incredibly-belated personal testimony. Still, Martin has insinuated in the past that such a trip must have occurred because he posted about the registration form on January 24, 2007, and the Associated Press reported on it on January 25. (At other times, such as in the blog quote seen above, Martin has erroneously claimed that the AP didn't publish the information until August 2008.) If Martin didn't get the data from the AP, where could he have gotten it from? That's easy. He got it from the same place he got all of the other information in the "Tracking Down Obama in Indonesia" series: from Indonesian-language news articles. Specifically in this case, a July 7, 2006 article from detikNews. That detikNews article cited every single feature of the school registration form that Martin mentioned. Every date, description, name, and number. It did not include a photo, and so neither did Martin. And of course, it was published over six months before Martin's blog post. Additionally, there's even good reason to believe that Martin read this very article. His first installment of "Tracking Down Obama in Indonesia", posted just four days before the one about the school form, was an English translation of a July 4, 2006 detikNews article. This information was subsequently republished in Indonesian media. A December 7, 2006 Indonesian article on Obama casually tossed off several of the features of the document: the entry date, the classroom, and of course, the name 'Barry Soetoro' (which originated with the school document). Martin wasn't even the first person to post online in English about the document. For instance, on January 22, a commenter at abcnews.com wrote "Indonesian journalist already investigated since July 2006 that Barack Obama, formerly known as Barry Soetoro, attended St Franciscus Assisi Elementary School...you should contact Detik’s editor at redaksi@staff.detik.com." To believe that he actually made such a trip in January 2007 is to believe that he failed to take a camera even though the document's existence was public knowledge (and thus obtaining first-hand proof would presumably be the goal of making such a trip in the first place), and to believe that when he copied down the information provided to him at the school, he only happened to copy down the exact same information that detikNews included in its story from six months earlier, and to believe that he failed to mention that it was an in-person investigation until 17 months later. And finally, to believe that all of that is more plausible than accepting that he copied the information from a news site that he admits he reads, from an article just a couple of days removed from another Obama article he'd translated earlier that week. So why make up a story about going to Jakarta in January 2007? And more importantly, why tell that lie to a national newsmagazine? I approached Mr. Martin for an explanation, but he declined to respond. Still, as we've seen time and again, Birthers are willing to go public with fictionalized first-person accounts. Ed Hale. Lucas Smith. Jim Bancroft. Tom Fife. Everyone who claims to have seen the non-existent Keyes/Obama Birther debate. Martin has ample company.